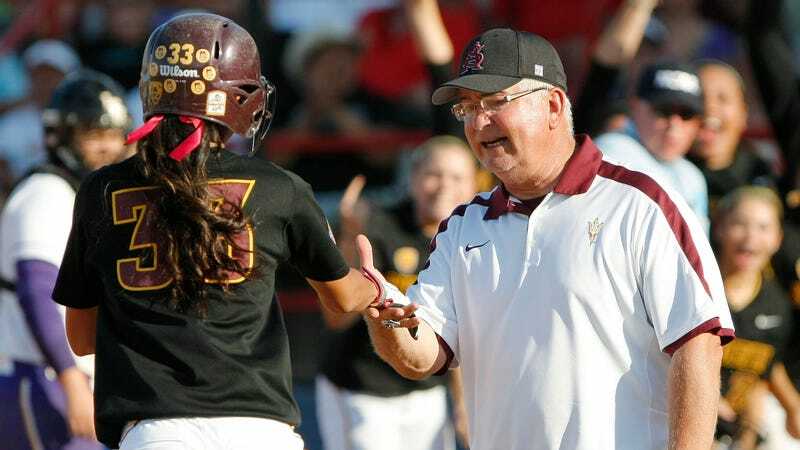 Before coaching softball at Auburn—where he was accused of subjecting players to sexualized attention from his son—Clint Myers coached the same sport at Arizona State; public records released Friday to Deadspin reveal that Myers’s son, Corey, was the center of an investigation there, too, into his improper involvement in the Sun Devils’ athletic program. A memo dated Jan. 13, 2011, addressed to Pac-10 associate commissioner Ron Barker, described the situation. At the time, Clint Myers’s other son Casey was a volunteer coach with the team; Corey Myers isn’t mentioned as having that designation in the memo. A letter dated Jan. 28 of that year and addressed to Myers went into further detail about sons Corey and Casey and their places with the team. Here is what it says about Casey Myers and the hiring of relatives. Myers left Arizona State in 2013 for Auburn, where Corey Myers became an associate softball coach. Corey Myers resigned in March; his father in August. That summer, softball player Alexa Nemeth filed a Title IX discrimination complaint saying that Corey Myers had “relations and [pursued] relations with multiple members of the team,” according to ESPN. Those who spoke out against this were, per the complaint, threatened by Myers and another university official. Overall, the records released by Arizona State showed Myers and his staff were the subject of several complaints, mostly related to rules and limitation on practice time and who can coach. All of the complaints released today by Arizona State are below.